Advanced filtration: Two ultra-fine mesh filtration baskets collect an impressive 190 cubic inches of dirt and debris. Simple to clean, the basket easily lifts off of the Aquabot X4 to be rinsed and replaced. Capturing debris, algae and bacteria as small as 2 microns-that's about 0.00008 inches. Save time and money: The convenient control panel lets you program your Aquabot X4 to perform hourly and automatic cleanings. Alerting you when the basket is full. Running on only 180 watts also saves on energy costs-about 15 times less than other pool cleaners. Extreme grip: Any shape or surface (a wheel kit is available for tile and fiberglass), the four-wheel drive (4WD) system with non-marring, high-grip wheels offer superior traction with minimal slipping. No more hard-to-reach places with traction that can handle 90° pool floor to wall transitions. More fun. Fewer chemicals: By circulating more water, up to 85 GPM, the Aquabot X4 relies on the superior cleaning power instead of chemicals gives you a cleaner pool and healthier water. Best-in-class warranty: Your investment is backed by a full bumper-to-bumper warranty for one year and a three-year warranty for the power supply, pump, and motor. Powerful cleaning: Durable, rotating micro brushes clean from the floor to the waterline and the wall climbing ability promotes an even more enhanced cleaning. 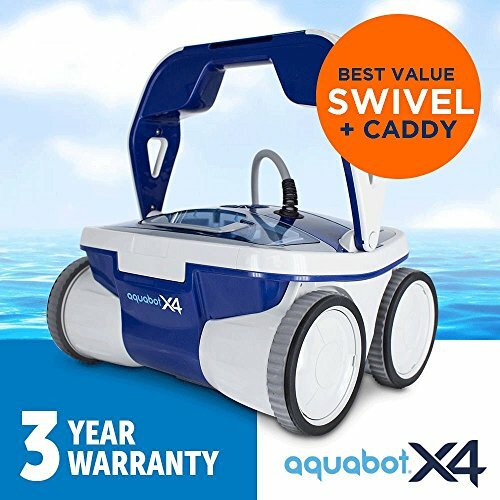 Tangle-free convenience: The anti-tangle swivel lets the Aquabot X4 clean hassle-free. The 360° rotation allows the robotic pool cleaner to turn and maneuver without tangling or twisting the 60 foot floating cable. Mobility built in: The Aquabot X4 comes while a robot caddy for easy transportation. Ideal for all pool shapes (above ground and inground) up to 60 feet. Highly energy efficient - each cleaning costs about 5. Industry-leading pumps circulate 85 GPM for a cleaner pool with fewer chemicals. If you have any questions about this product by Aquabot X4, contact us by completing and submitting the form below. If you are looking for a specif part number, please include it with your message.